Greetings friends, fam, fans and Faith Walker faithful. Welcome to the latest chapter of Matthew Cross: Faith Walker. The Champion is trained for spiritual warfare and mortal combat as an agent of The Knighthood of The Light. Matthew Cross is anointed with power from on high, suited in the Garment of Praise, wielder of the Arsenal of Light,as he wears the Mantle of The Faith Walker! Set in the modern era called the last days, he shares the Light while standing against the Forces of Darkness. We interrupt our originally scheduled entry to present this on fire special edition. 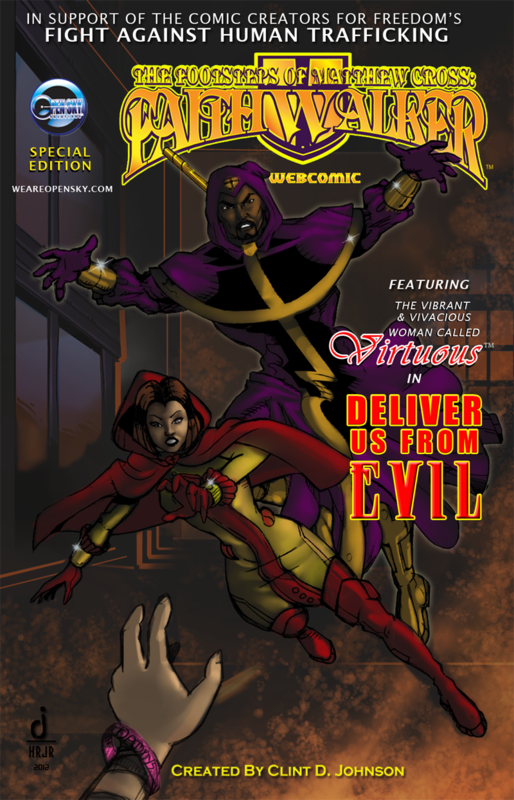 "Deliver Us from Evil" is a critical Faith Walker story in support of the Comics Creators For Freedom’s movement against Human Trafficking. Open Sky Creations has created this adventure features our poster girl Virtuous side by side with Faith Walker against the devious slave trading duo called Baal and Chain! Creative duties delivered by: “Cool” Clint D. Johnson(story/interior/cover line art) and stunning cover colors by ”Hot" Herbert Richardson, Jr. Ink finishes provided by "Go get'em" Jose Guillen . "Characters you can believe in"
Follow The Trail In 2012!